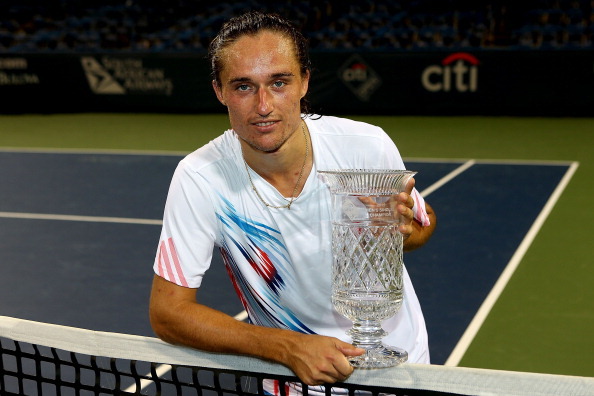 Alexandr Dolgopolov formerly known as Oleksandr Dolgopolov Jr., is the top-ranked Ukrainian male tennis player. Dolgopolov was part of the Ukrainian Davis Cup team in the tie against Great Britain, where he was defeated by Andy Murray. He made his ATP Tour debut in September 2006 at the BCR Open Romania as a qualifier. In 2011 Dolgopolov and Malisse beat 2008 Beijing gold medalists Roger Federer and Stanislas Wawrinka to win his first ATP tour doubles title. Following this he beat Cilic to win his first ATP singles title. Alexandr won his first ATP 500 at the Citi Open in Washington D.C. in 2012 having defeated Tommy Haas in the final. Dolgopolov has an unorthodox but all-court playing style; he can counter-punch when needed, but can also be very aggressive. Dolgopolov is able to quickly and suddenly hit the ball at the last moment, making him one of the most deceptive players on tour, as it is hard to anticipate where he is going to hit the ball. Madrid Masters: With Djokovic's unexpected withdrawal, will Rafa hold sway?